In a world of divers, it’s refreshing to see a sporty watch that doesn’t require a rotating bezel. 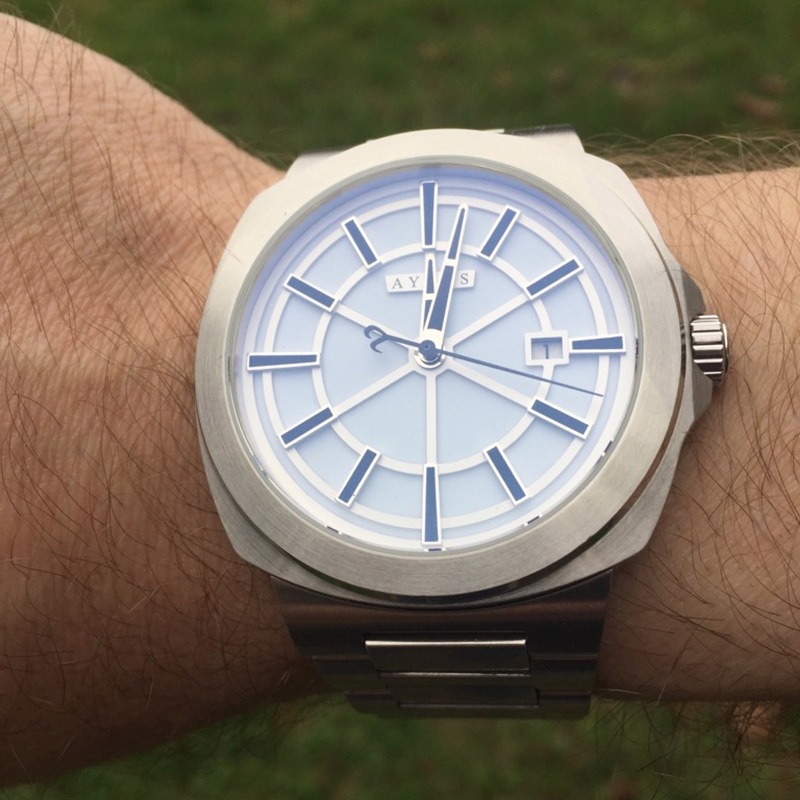 The Ayers Metropolitan watch is this, and more. It’s a fully modern, dedicated follower of fashion. Oh yes, it is. With a fully luminous dial, it requests, no– demands further examination. It swallows my whole wrist! First of all, the dial: The dial is a fully luminous backdrop, with raised spokes. The hour indices are black, and nestled within the raised spokes. The spokes themselves are light-colored and fade into the background when I look at the dial in daylight, glancing at it throughout the day. Check out that depth in the dial. Fantastic! At night, the spokes become hugely apparent, crossing the dial in black relief as the dial glows brightly. The spokes look most like a wagon wheel. Earlier iterations of the design had more spokes, and made it look much more radiant, in a way. Nevermind those early versions, here’s what we have now. Because the hands are also filled in with black, they appear in relief to the dial as well. The difficulty for me is that they are nominally the same width as the spokes on the dial, and disappear into them as they cross them. Don’t ask me to tell the time at 12, 2, 4, 6, 8 or 10 o’clock, or any of the 10 minute intervals at 00, 10, 20, 30, 40, or 50. If it’s night, I probably won’t be able to tell the time at those times. This problem can be overcome by choosing a dial and handset with different lume than the sample I received. The bracelet is a stainless steel monster, with brushed and polished surfaces, and the end link is integrated into the case. It’s a beautiful bracelet. The clasp is particularly lovely, with engine turned decoration on the inside mating surfaces of the clasp. That’s right, they decorated the clasp in places you can’t even see it unless it’s off the wrist and open. Be careful adjusting the bracelet, however: there are two half-links on either side of the clasp, and the first link after the half-link is deceptively unique. It looks like every other link, but is the only link that can fit in that position properly. When any other link is in that spot, the threaded screw won’t line up with the holes in the link by about .5mm. This should be fine on a newly received watch that hasn’t been adjusted, but in my case, the watch had been adjusted prior to my receiving it, and putting links back in the bracelet was an hour of frustrating finding the correct links. In this case, it was best to put links back in the bracelet closest to the head of the watch. They machine finish details you don’t even see with the clasp closed! The case isn’t small. It’s a 44mm watch, and wears as big on the wrist as that sounds, but the redeeming factor is that the case is not absurdly tall, coming in at 10.5mm. The display back shows off the Miyota movement and decorated rotor. It feels big, it’s got a decent amount of weight to it, and if you like a heavy, large watch that isn’t a diver, this could be for you. Expect the Metropolitan to cost $400 and be worth every penny. Sign up to be notified the minute the Kickstarter launches at AyersWatches.com. Would I buy one for myself based on what I’ve seen? : That bracelet is fantastic. It tempts me. It mocks me. It keeps me up at night. If I could make one design suggestion, it would be: The dial detail feels like a wagon wheel to me. I need something different in the dial. What spoke to me the most about this watch: The bracelet finish and the case construction, particularly the lugs.